Cannas are a tropical plants that grow from rhizomes. They have large alternating leaves. 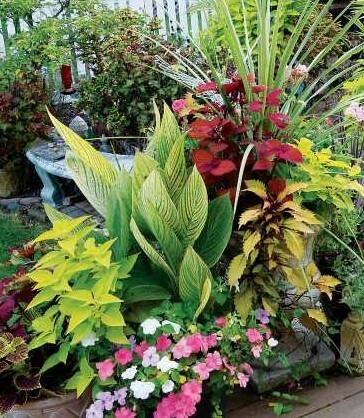 Many cannas have a green foliage. However, I want to introduce you to some very interesting cultivars that are now a strong part of my garden. First is my absolute favorite: Canna Tropicannia. Canna indica ‘Phasion’. Yes, they are costly. But in the fall, dig up those rhizomes. I use them in containers only, and it’s easy to harvest the rhizomes. Of course now and then you will let one go. If purchased in a one gallon pot, you will probably will pay from $25 to $40 for one. I have purchased them at Meijer, Lowes and online. You can purchase just a rhizome for approximately $12 and $15 each. My first purchase, of eight, were gallon pots. Yes, it was a large investment, but I’ve had years of enjoyment and impact in my garden. The bloom on this is orange. I grow it for the foliage and not the bloom. I love to pair them with Croton in containers. The colors are stunning together. I also pair it with a favorite coleus. 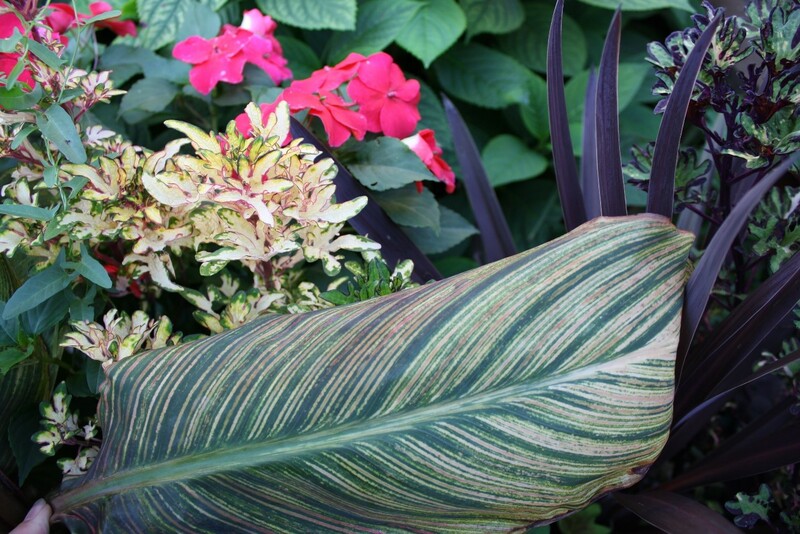 This coleus matches so perfectly with one of the variegated stripes in this canna. This canna grows smaller in my containers; However, it can attain a height of 6 feet if planted in the ground. The following photo shows the variety of color that will appear when the foliage is not as mature. You can see that the newer foliage at the base is greener. It also has the green stripe in the leaf so it easily pairs with other green foliage. The light received also will affect the color intensity. 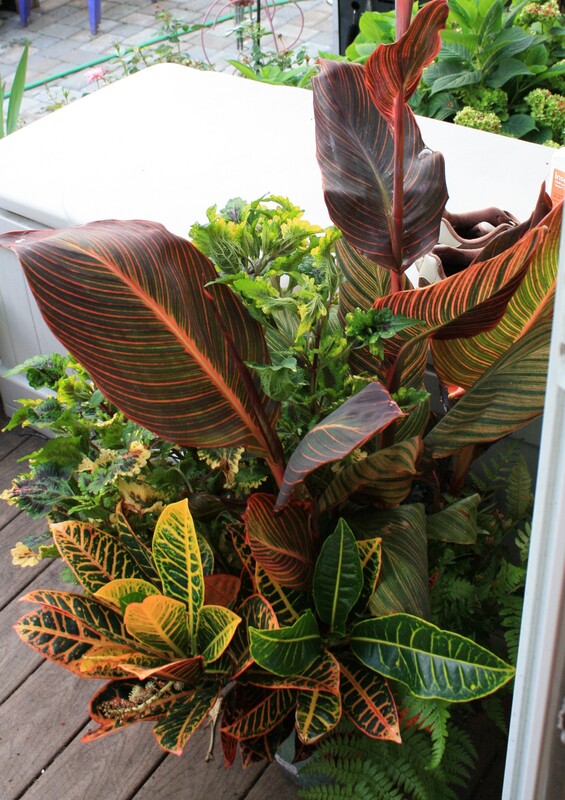 You will notice in the photo with the croton, that the foliage is darker. This is due to the fact that it is in shade most the day. Whereas, the one with the green is in the sun for a much longer period of time. It appears lighter and brighter in color. 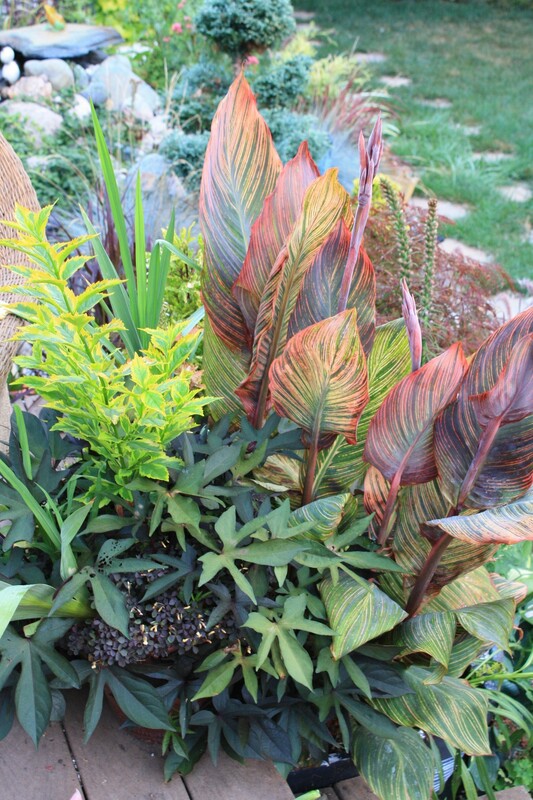 I also like to use a couple of canna Pink Sunburst in pots. It has a pink hue on the variegated leaf. My photo collection only contained one of this variety. I usually use tones of pink with it. 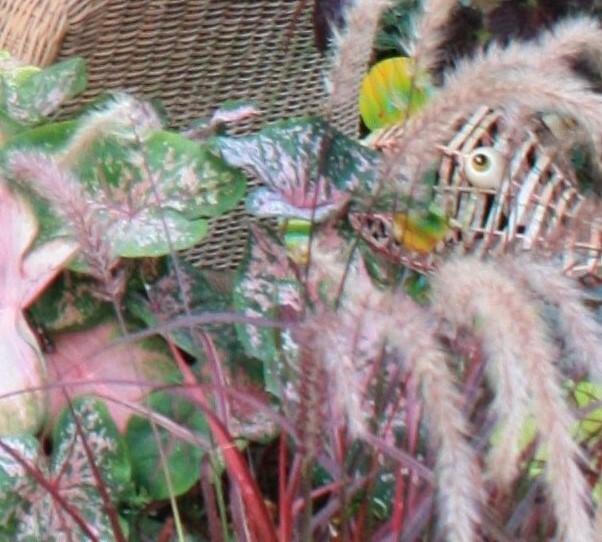 Try pairing it with Caladium and Japanese blood grass, like those shown in the photo below. It works well. The bloom on this is pink. The next favorite is canna Bengal tiger. A beautiful variegated green with lime green. The bloom is orange. Here you see it among coleus varieties and impatiens. There are several varieties that have deep purple or maroon foliage as well. These have been in my garden; however, I do not have photos. 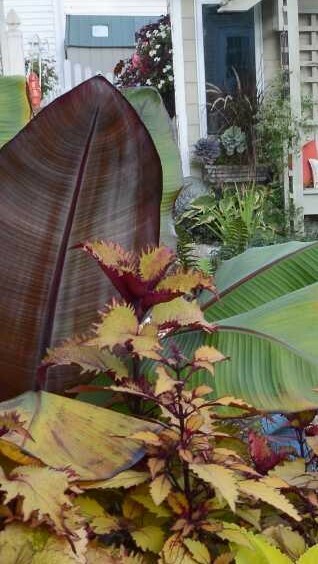 The color is much like this banana plant shown below. The banana now is the replacement for that canna. The banana offers green as well on the underside, yet gives me the deep purple and large leaf I desire. You can search the net for varieties like ‘Australia’, and ‘Russian Red’ that give the deep burgundy color. 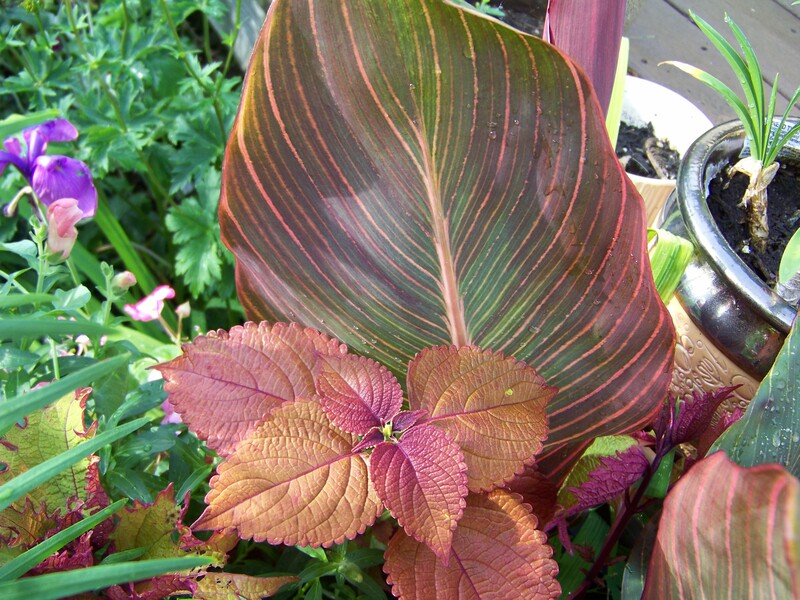 Check out this canna that has both green and burgundy on the foliage. Not only is the foliage a split color so is the bloom. The bloom is both red and yellow. The name is ‘Cleopatra’. Here is a link on Dave’s Garden Blog: https://davesgarden.com/guides/pf/showimage/26798/#b. This is going to be one purchase of mine this year. It’s another costly one. They sell it in a 3 quart pot for $24, plus shipping. Certainly there are rhizomes out there that will cost less. We all want something unique in our garden. Mostly, you will see those with a green leaf. One of our Master Gardeners shared these with the group. Into to the ground it went. They grew about seven feet tall. That fall I saved and shared the rhizomes with friends who are still planting them in their front yards every year. Cannas can sure make a large impact. 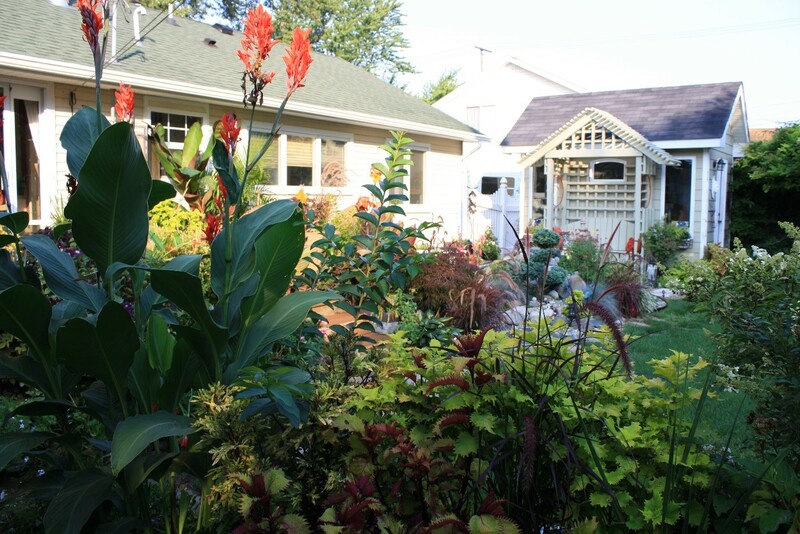 They add height, as well as color from foliage and bloom. Oh, need I mention they attract those wanted hummingbirds as a bonus.